A special moment in my life took place this past Friday, when Algonquin elders took part in the ‘Faith is Peace’ walk (Victoria Island to Parliament Hill). What made this walk so profoundly joyful and memorable for me is the fact that many of the region’s faith leaders walked with us in support of our struggle for sacred Akikodjiwan (Chaudière and Albert Islands). Together we stood as one! Shoulder to shoulder, heart to heart, Indigenous roots intertwined with settler roots, the walk became a moving, breathing statement to Canada. All present were in agreement, First Nations spirituality is a faith. And as a faith with its own unique foundation and creation story, the First Peoples’ places of worship must be protected. Shielding them from abuse must be done with the same force and vigour Canadians would put into motion to protect a synagogue, a temple, a mosque, a church or any house of worship in a free world, if it came under attack by people who had no respect for it. Are we not duty-bound by Canada’s constitution to do so? We all enjoy a ‘right’ enshrined in the constitution which guarantees freedom of religious expression. The First Nations are no longer excluded! So back off, NCC! I see a faith leader as the sparkle of a firefly, offering the depressed and downtrodden of their community hopeful light, on even the darkest of nights. 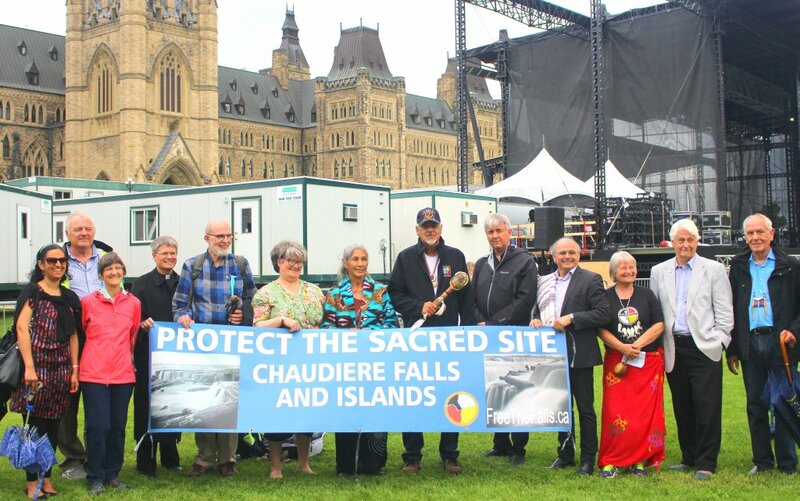 It was with enormous pride in my heart that I heard such faith leaders eloquently express their support for our cause, the saving of our sacred site Akikodjiwan. Words from Archbishop Prendergast, Rabbi Bulka, Imam Samy Metwally, the Very Reverend Shane Parker and many others gave us renewed hope that Akikodjiwan will be saved. The words of the faith leaders were spoken, written and recorded on film and will be posted online in the near future. It truly was a humbling time for me and one I’ll always remember. Elders, faith leaders and representatives, 23 June 2017. First Nations spirituality was outlawed until almost 1960. This terrible act of oppression was in my opinion, the worst of the many outrageous actions Canada took in her efforts to destroy the culture and identity of the First Nations at a time now referred to as ‘a dark chapter’ in Canada’s history. Today we often see media-produced photos or film footage of politicians partaking in a smudging ceremony. For most of the politicians who do so, it is nothing more than a photo op. Anyone who really respects these ceremonies would never vote yes, allowing a developer to defile, desecrate and destroy Akikodjiwan, a sacred site of the Anishinabe since time immemorial. Look around! Terrorism and catastrophes are taking place in all areas of the planet. The world does not need more condos! We need more sacred sites, not less of them. It is not too late, we can still save Akikodjiwan from destruction. The ‘Faith is Peace’ walk was all about that! As difficult as it might be for the good people of this country to emotionally digest, the truth is that the First Peoples are still fighting every day against oppression. We fight to regain our languages, we fight for a share of the riches being removed from our territories each and every day so that our impoverished communities can grow an economy and build schools. But it is the struggle to revive our ancient spirituality which is of greatest concern for me and many, many more Algonquins and their supporters. Our spirituality was our way of life! Is it too much to ask to have it there once again for those of us who respect and honour it? There wasn’t much media attention for the ‘Faith is Peace’ walk. Very strange, considering the fact that this rally was the first of its kind (where interfaith groups rallied to support Indigenous spirituality), so far as I am aware. It is extremely puzzling to the walk’s organizers as to why the media chose to stay away. In a free country, both sides with opposing views are heard. It is only fair and just that it is so. Then why is it that with Akikodjiwan, the only voice being heard is that of politicians and Algonquins who support the destruction of a sacred site? In Canada, money is power and in this case money dictates that Akikodjiwan will be lost to us. Not so fast! Let the people decide. If the walk was a success then it was made so by the many dedicated people who pitched in to make it so. A special Migwech to Algonquin elder Jane Ann Chartrand for her generous contribution to this cause and for her steadfast dedication to Akikodjiwan. This entry was posted in Community, Idle No More, Spirituality and tagged Akikodjiwan, Albert Island, Algonquin, Anishinabe, Asinabka, Chaudière Falls, Chaudière Island, condos, DreamCorp, faith, Faith Is Peace, Great River, Justin Trudeau, Kichi Sipi, Lebreton Flats, OMB, Ottawa, Ottawa River, Petition, Reconciliation, sacred land, sacred waters, spirituality, unceded, UNDRIP, Victoria Island, Westeinde, Windmill Development Group, Zibi. Bookmark the permalink.